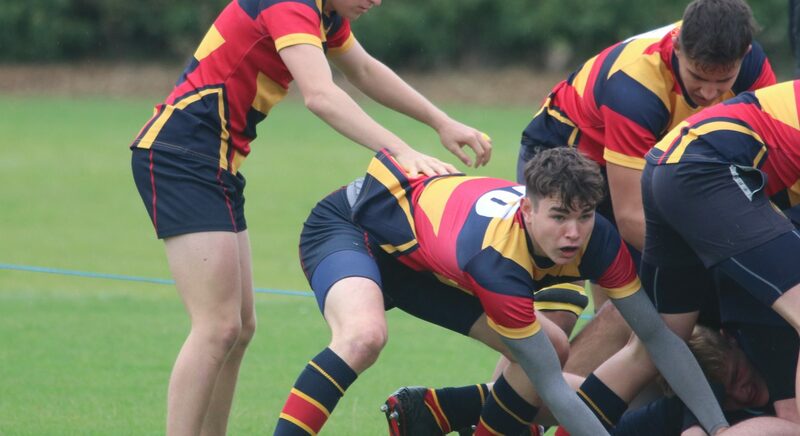 home > Calendar & News > Latest News > Senior > 1st XV go into half term on a high! 1st XV go into half term on a high! The 1st XV continued their run of form with a superb performance against Hereford Cathedral School. Travelling down on the Friday night, the 1st XV squad also worked with the U15 side to help them set goals for their game, while also setting their own individual process and performance goals. With the game being moved to Ledbury RFC, the 1st XV were presented with an excellent venue for the game and were also lucky as ‘Storm Callum’ held off, leaving just a heavy wind but no rain. Playing into the wind in the first half they had to manage the conditions, some powerful carrying and patience with the ball eventually allowed Henry Hoyles to power over from five yards in the early stages of the game, executing the game plan with efficiency. As the half went on the Wisbech Grammar continued to exert pressure, and as they adapted to the conditions, they were able to stretch the Hereford defence. Eventually fly-half Frazer Brown made the most of the gaps between the defenders, gliding through to give the 1st XV a 14-0 half time lead. Despite having the advantage of the wind in the second half Wisbech Grammar spent the first 20 minutes defending their own line, on two occasions with 14 men. Some last-ditch defence by Charlie Coles stopped an almost certain try in the right-hand corner before some heroic team defence held Hereford at bay; a spell of play that energised the 1st XV and appeared to drain the Hereford side who had exerted so much pressure. With their first real possession in the opposition half, it was fly-half Brown who glided through a gap again and having defended for so long Wisbech Grammar now had a 21-0 lead and a real sense of ambition and positivity; this, combined with a more tactically astute approach to the last quarter, saw them score three superb tries. The first through Will Gowler, who was on the end of some good handling by the forwards and cut a beautiful line on the outside shoulder before rounding the scrum half and full back and going 60 meters to extend the lead. Luke Fey then scored his first 1st XV try following a good break by Henry Hoyles which then led to some slick hands from Sam Landles and Jack Trundley, putting Fey over in the corner. Finally, Trundley finished off some excellent play from Hoyles once again as he held off two men and made a line break down the left wing before offloading back inside. The performance was up there with one of the best all round 1st XV performances in recent years as the 1st XV won 38-0 against a good Hereford Cathedral side. They now go into the half-term break with three wins on the bounce and look forward to travelling to Ratcliffe after the break.